It’s always exciting to meet someone you’ve admired and yesterday I got a chance to meet talented fashion designer, Alexander Michael Snyder! If you’re a Project Runway fan, you’ll remember Alex from last season. Alexander was kind enough to let me try on this dreamy fit and flare coat, lovingly nicknamed “The Beast” for it’s substantial weight! Isn’t it AMAZING?! I became a fan watching Alexander in Season 15 of Project Runway, but he has been part of the fashion world for much longer than that. He showed a collection at New York Fashion week in 2009, and along with being a talented designer, Snyder understands the business side of fashion as well. Originally from the East Coast, Alex came out to San Francisco to go to school for his Masters of Fine Arts degree and decided to stay. He’s intrigued with integrating technology with his creative visions and of course Silicon Valley is the perfect place to explore that! Alexander also shares his experience with others, mentoring new designers and teaching classes at The Art Institute. So, how did I get a chance to meet him? Well, I asked! And Alexander warmly welcomed me into his design and manufacturing studio, sharing with me all his stunning creations. I so enjoyed chatting with Alexander. We both share an affinity for the fun of fashion! I also admire that the AMS collection is size-inclusive. Alexander firmly believes that women as sizes and ages deserve to feel beautiful. Who is Alexander’s customer? He likes to describe his muse as an Upper East Side lady who isn’t afraid to get on a motorcycle. An upscale and classy lady with a rebellious streak … who wouldn’t want to hang out with her, right? Following AMS_Atelier’s website, I’ve been drooling over the fall 2017 collection inspired by “The Hitchcock Blondes.” I’m loving this feminine silhouette, paired with modern sensibility. 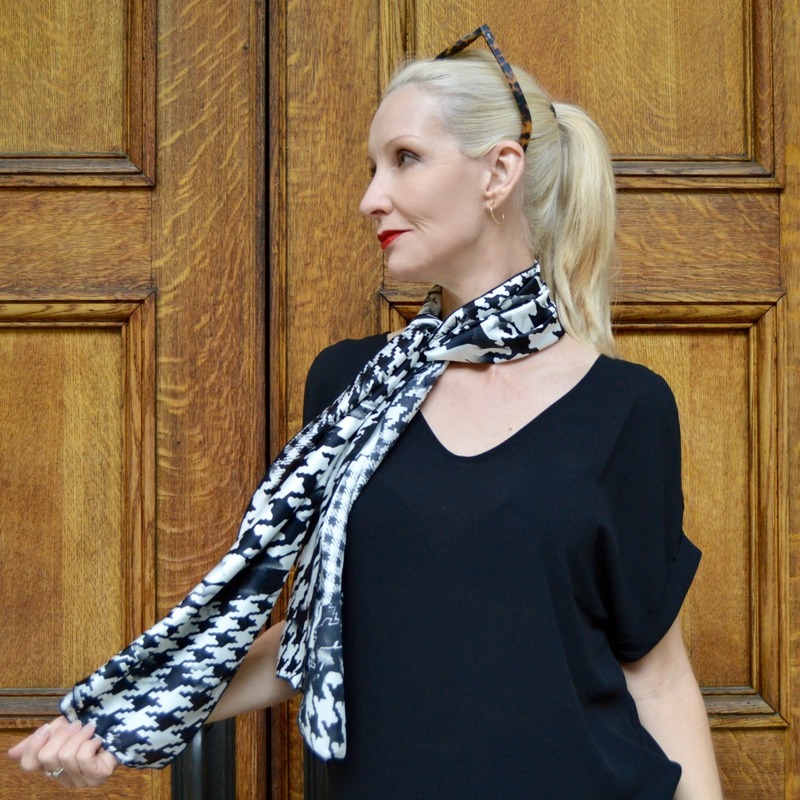 The brand makes it’s own prints, and my favorite is the modern twist on classic houndstooth pattern, giving it a dreamy MC Escher-eque feel. You can check out the gorgeous collection here and don’t miss the sensational sequined pieces! And can you believe Alexander gave me a scarf in my favorite pattern? I’m over the moon excited! What a sweetheart! Okay okay, so I was totally trying to channel some Hitchcock Blonde in that last shot! I will treasure this gorgeous scarf for years to come! A huge thanks to Alexander for making me feel so welcome and for being so inspiring! Be sure to follow Alexander on Instagram too to see all the fabulous things he has in the works, including a charity fashion show with the whole Project Runway Season 15 cast! How amazing is it that you got to meet Alexander Michael Snyder! That coat in the first photo is to die for! It’s like it’s made for you…. I loved learning a bit about his background, and I’m truly jealous of that gorgeous scarf. Thanks, Andrea! It was such a cool experience and he couldn’t have been nicer! I am so happy for you and that you got a chance to meet Alexander Michael Snyder. That scarf he gave you is such a gorgeous piece. I love it on you. And omg, that coat is just so beautiful. Glad you had fun hon! Aww thanks, Dear! Isn’t that scarf stunning?! Absolutely loved this inside look into Alexander’s design world! The fit and flare coat is beyond amazing! And you totally rocked the Hitchcock blonde look with your amazing scarf! Thanks so much, Kali! OXOX! How cool and so fun that you got to meet and interview him! I love the scarf he gave you!!! No! Omg! I want to wear all his clothes! But seriously, you know that feeling in your hart when you are clothes that you just adore! That houndstooth print is amazing and I also love that grey black skirt in his lookbook. It is a really fabulous collection! Hee hee … you’re so cute! Yes, I want to wear them all too! Hello my dear! 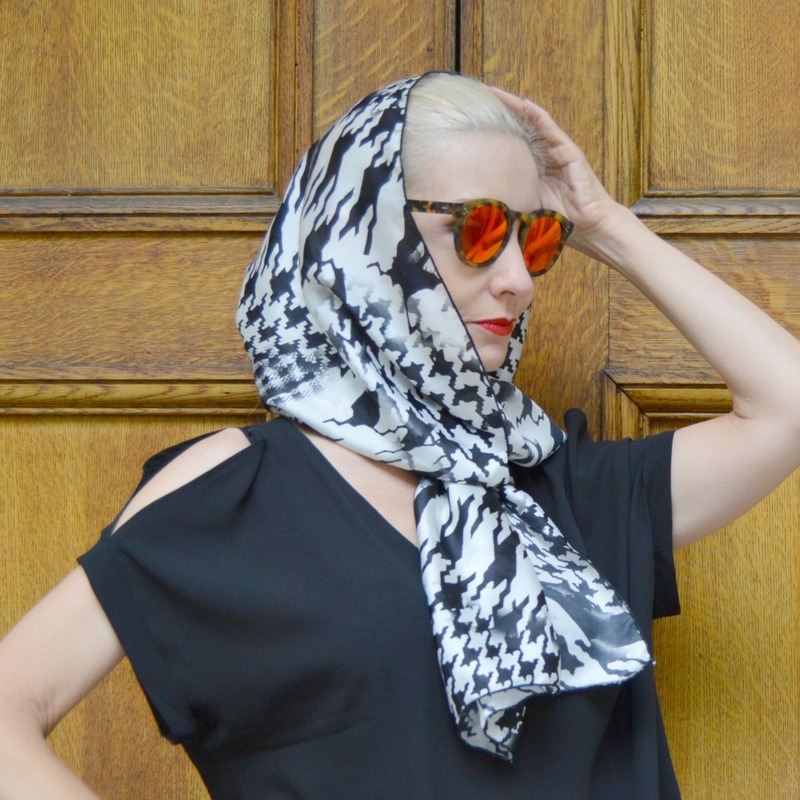 Your styling is fabulous – my favorit is your scarf. What an incredible opportunity, Dawn!!! I love it when you get to meet those that you’ve always admired!! And aren’t you the luckiest girl ever?? Sometimes I really feel like I am, Jodie! #blessedlife. This is so amazing! Love the interview and his collection is fabulous! I LOVE that you ‘just asked’ and he said YES! People don’t seem to realize that you have nothing to lose when you ask for something. All they can do is say no…so why not ask because they might just say yes! Kudos to you and you look FAB in his coat! Oh my stars! How amazing! What a great post! Thank you for sharing! This coat is so cool! I also like how you draped the scarf! Thanks for linking up to Top of the World Style.